Rental script is built to manage your own rental platform for renting all kinds tools. This php auction rental script is an amazing product rental script that helps vendor to offer their product without any financial support. We are offering best rental script where vendor can post the any product for renting purpose. In our script we have integrated the entire feature for the prefect rental scripts all clients need to buy our script and enjoy to the next level of rental script. 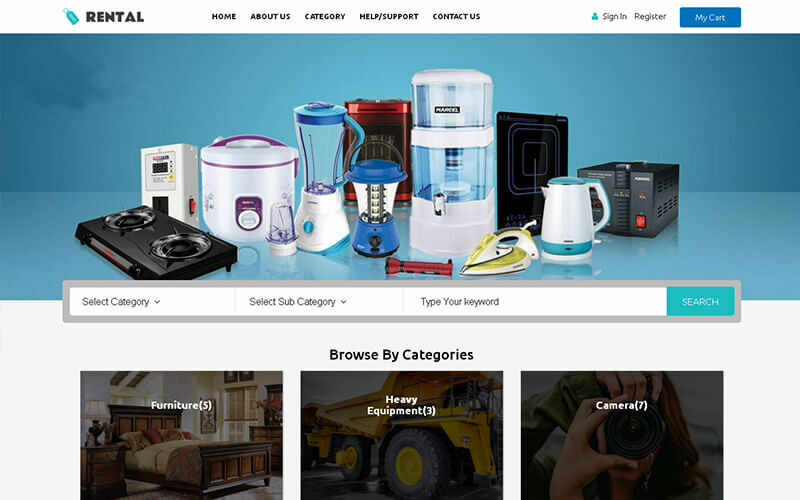 In the hectic world it is very difficult to buy all products for short time usage and again need to sell the product to the right person id difficult so that we are providing the best online rental software to reduce the kinds of difficult to user. It helps the people to get the product to for a certain period of time with the minimum charge on the product. In other words the user doesn’t need to buy the entire product for short time usage of the product. By using the open source rental Script the user can get the product for rent.It helps to both the client and vendor or service provider enjoys using the online rental platform. For vendor in help to increases the business and marketing campaigns with the short terms without investment on the any ads, it is very helpful for the small scale business. For client or user can no need to buy product for any short time use, no need to worry invest on product and no worries on the warrant and product malfunction.All the things will be taken over by the vendor all users need to get product for rent. In many rental software where vendor need to give some percentage commission to the admin, but in our ecommerce rental software there is no commission instead of that user admin need to add the many vendor to the system, so it help the user to rent many product it would become an assets in the online for this admin will get the revenue from the system. Our rental script online platform is developed already have all kinds of feature and functionality that will help to kick start your idea with high quality. The advantage of other script compares to other software in the market, we have given the best script based on the client requirement and it can be customize for client’s requirement. People in Php Scripts mall are tech minded. They are cool in handling of my requirements and required output. I wanted Ecommerce Rental Software should work across all platforms and they did it quickly and modified as well. When I was in problem with code they responded quickly and I will suggest you to working with PHP Scripts Mall. They are good at what I looking for and exactly understood my needs. Sure I will work with them again.